This looping animation shows the sky low to the east-southeast horizon as seen from the centre of the British Isles from 23 October to 3 November at approximately 6am BST (or 5am GMT when daylight saving time ends on Sunday, 25 October). The interval between frames is one sidereal day, hence the stars appear fixed and the motion of the planets relative to the constellation Leo becomes clear. Venus reaches greatest westerly elongation from the Sun on the morning of Monday, 26 October — the same day it appears closest to Jupiter (1° separation). Eight days later, on 3 November, the brightest planet passes even closer to Mars (0.7° separation). For scale, the graphic is about 40 degrees wide, or twice the span of an outstretched hand at arm’s length. AN animation by Ade Ashford. 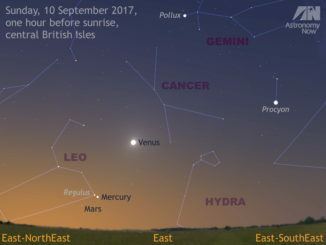 In two former posts (see here and here), I drew your attention to the gathering of naked-eye planets in the east before dawn. Up until now, all of the Venus—Jupiter—Mars activity has occurred in the constellation Leo, but on Monday, 2 November magnitude+1.7 Mars crosses the border into Virgo. Hot in pursuit, magnitude -4.3 Venus also crosses the Leo-Virgo border the following morning when the two planets will be closest at just 41 arcminutes apart, or ~0.7 degrees. 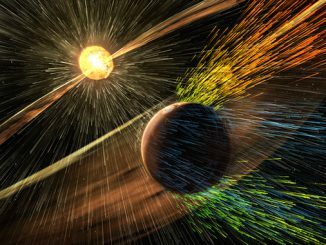 On 3 November, Mars will have a miniscule disc spanning just 4.3 arcseconds, or one fifth of Venus’ diameter. 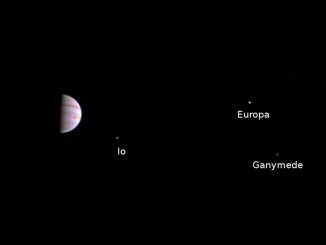 However, you don’t need a telescope to follow the changing configuration of these three fascinating planets on successive days as it will be obvious to the naked eye or in binoculars. And if you have a low-power, wide-angle binocular, you can encompass all three in the same field of view throughout the period in question — if weather permits, naturally! You can find out more about this month’s planetary peregrinations in the November edition of Astronomy Now in addition to a full guide to the night sky.